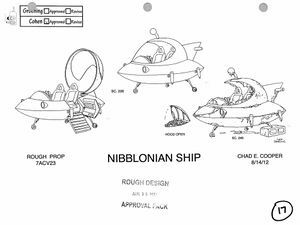 Digby's old spaceship is a spaceship that, on the night of 31 December 1999, Nibbler's personal chauffeur — Digby — used to land Nibbler on the rooftop of Applied Cryogenics. [7ACV23] Digby and Nibbler then went drinking at O'Grady's Pub, but Digby accidentally dropped the ship's keys in a gutter, so they had to take a cab back to their base on Vergon 6, where Digby's boss gave him a new ship. Digby then began going planet to planet looking for the old one. In 3013, he was still looking. By using the old ship's key fob, he had constantly been emitting a deafening melody, which had destroyed a planet and was causing seisms on Earth. A musical response to the melody prompted him to land on Mount Shushmore, where he found Nibbler and the rest of the crew, as well as Nixon and Agnew. Fry helped him retrieve the old ship, which was still at Applied Cryogenics, although its cassette player had been stolen and its battery was dead, and he then flew away in it. Digby's old spaceship was first seen in a piece of concept art, released by Countdown to Futurama, in June 2013. It was also featured in a selected animatic for 7ACV23, which had been released online by July. ^ a b Countdown to Futurama: Nibblonian Ship. (Comedy Central's Tumblr page.) 03 June 2013. Retrieved on 19 August 2013. This page was last edited on 2 March 2014, at 22:47.